Living… in San Francisco. Charlie and his four siblings were devastated after a drunk driver killed their parents. Charlie immediately became the head of the household, effectively keeping him in San Francisco for the foreseeable future. He’s had to reject jobs in the past because the entire family would have to move with him. Just as most young people his age are leaving the nest, Charlie is building his. Profession… bartender at Salinger’s Restaurant – the family business started by Charlie’s father. After his parents died, Joe Mangus, their father’s partner in the business, lent Charlie money in exchange for a bartending job. He’s ambivalent about the job. He knows he needs the money to support the family, but he rejects promotions to manager, hoping his stint there will be short. Interests… his future, as well as his siblings’. Charlie begins taking night classes at Berkeley to supplement his degree, and he encourages the same focus on education to his siblings. In addition to his own prospects, Charlie does his best to make an ideal living situation for his family – particularly when under the eye of social workers who threaten to take his younger siblings to foster homes. Relationship Status… single. With his good looks and charm, Charlie had been a bit of a womanizer in the past. But this time he has fallen hard for Kirsten, the kids’ nanny who is beautiful, bright, and caring. There’s only one problem – she’s engaged to someone else. Kirsten seems to care for Charlie too, but she is afraid Charlie only wants her because he can’t have her. Challenge… being the new head of the family. Charlie is faced with a host of new responsibilities that would overwhelm any young adult. He’s helping his older siblings though the difficulties of adolescence, and caring for his younger ones, all while trying to self-actualize. He has to sacrifice opportunities most college graduates would accept in a heartbeat. Like a parent, he has to consider his family before himself. Personality… evolving. Charlie left school early in order to “find himself,” and just as he was hoping to re-enroll, tragedy struck. He’s insecure about his shortcomings and tries to compensate. Nevertheless, he demonstrates the soundness of mind and courage to act as a guardian to his siblings. He is genuinely invested in their wellbeing and success and goes to great lengths to keep them safe and healthy. Charlie Salinger's popularity ranking on CharacTour is #5066 out of 5,000+ characters. See our top-ranked characters and read their profiles. 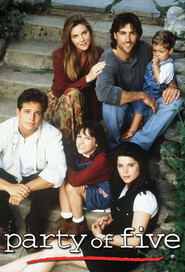 Party of Five is an American teen drama television series that aired on Fox for six seasons, from September 12, 1994, until May 3, 2000. Critically acclaimed, the show suffered from low ratings and after its first season was slated for cancellation. In 1996, it was the surprise winner of the Golden Globe Award for Best Drama, making it one of the lowest rated shows ever to win the award. The show launched the careers of cast members Neve Campbell and Jennifer Love Hewitt, who both starred in their own box office hit slasher films, Scream and I Know What You Did Last Summer, respectively, while also appearing on the series. The show was also the launching pad for the careers of Lacey Chabert, who later starred in the hit movie Mean Girls; Matthew Fox, who would later go on to star in the ABC hit Lost; Scott Wolf who would star in the movie Go and the 2009 remake of V; and Jacob Smith, who later starred in the Cheaper by the Dozen films. In 1999, the show generated a spin-off, entitled Time of Your Life, which followed the character of Sarah as she moved to New York. It ran for just one season. In 1995, TV Guide named the series "The Best Show You're Not Watching."